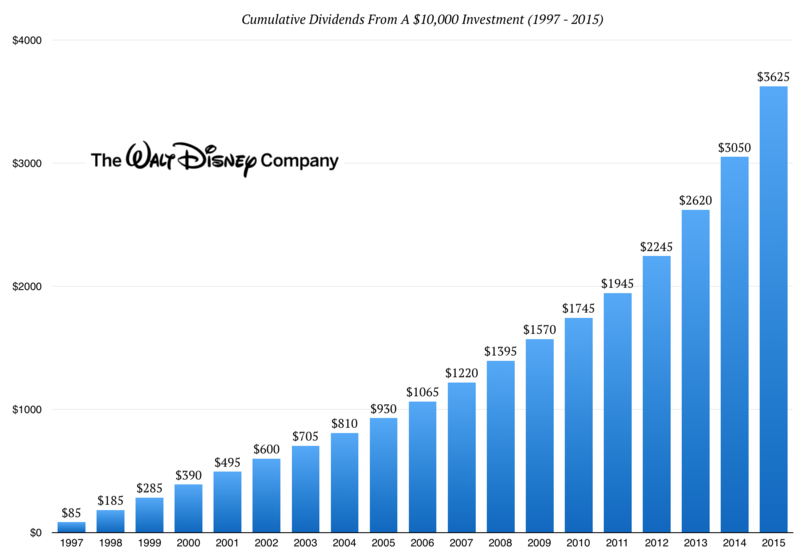 As a follow up to Thursday’s article on The Walt Disney Company (NYSE: DIS) I thought I’d run through the last twenty years of stockholder returns. In the first piece I made the comment that there are really a couple of things that Disney has done exceptionally well over the years, but particularly in the past decade or so. The first is the way the company have unlocked value from their vault of unique content and franchises, something which has increased their underlying profitability enormously since CEO Bob Iger took over in 2005. There was a feeling during the Michael Eisner days that perhaps Disney was a bit of a sleeping giant; the company held enormous leverage over the lives of millions of kids who grow up with their creations but needed to more aggressively turn that into as many dollars as possible. This is exactly what they’ve been doing over the past ten years. The second thing that Disney has nailed over that time is growth. The figures are astonishing. Remember in the previous piece that I roughly think of Disney in two terms: the content and brand equity side of things and the networks segment driven by sports giant ESPN. The combined five-year income growth rate for the segments in the former camp – that is their parks and resorts, all the consumer products from Disney stores, the profits from cinema releases like the new Star Wars movies and so on – is at 20% a year. When you add that all together: growth, high quality earnings and a long time frame, then it’s probably not surprising that Disney has delivered incredible shareholder returns over the past couple of decades. Let’s go ahead and take a look a hypothetical twenty year investment in the stock. Back at this point in the summer of 1996 Disney stock was trading for $20 a share on a split adjusted basis. In the prior year the company pulled in roughly $12bn in sales; $1.38bn of which hit the bottom line as net income. Translated into per-share figures that is equal to $5.67 a share in revenue and $0.86 a share in earnings. As a potential investor back then you are seeing the stock trade at 23x their prior year profits. You know that those earnings are high quality and by reading the annual report you see that the company has a library of hundreds of films – backed up by theme parks, Disney stores and then diversified by their various media networks. In addition the company had paid out a dividend of $0.12 per share to stockholders in 1995, a figure which was 20% higher than in 1994 and had increased by 20% a year on average since 1992. You think that a price-to-earnings ratio of 23 and a yield of 0.6% is a bit expensive, but given the quality of those earnings and the likelihood that they are highly dependable and will grow in the future you decide to buy 500 Disney shares (split adjusted figure) by enrolling directly in the company’s stock purchase plan. You send off the order form to Disney’s registrar along with a cheque for $10,000, and also tick the box that tells the registrar to send you a cheque every time the company pays out its dividend, thinking it safer to not reinvest in more Disney stock for now. Every year the company mail out a copy of their annual report, you see that their profits keep rolling in and you don’t particularly feel the need to check up on how your investment is doing. From one year to another the stock price varies but you are content with that because Disney never once stops churning out those high quality profits. After twenty years you figure it has been a sufficiently long enough time frame and so you decide to check up on your holdings. The first thing you see is that the initial $10,000 capital is now worth $47,900. The $5.87 a share in revenue and $0.86 a share in profit back in 1995 have grown to $30.69 and $4.90 respectively as of financial year 2015. In addition the company has retired 19% of the outstanding shares over that twenty year period, increasing your ownership of the company’s profits even without reinvesting any of your dividends. Speaking of which, those dividend cheques over the years would add up to a cumulative total of $3,625. The $0.14 a share payment received in 1996 has grown at a compounded annual rate of 11% and was worth $1.15 per share last year. Next year you would be looking at a yield on cost of 6%, quite low after twenty years because of Disney’s historically small dividend yield and relatively high valuation. Between 1999 and 2004 for example the average annual P/E ratio never dropped below 20x earnings. Between 1999 and 2002 it had averaged well over 30x earnings in each year. Let’s assume that rather than collect that dividend cash you ticked the other box on the purchase plan enrolment form, the one that instructs the company to reinvest it into more Disney stock instead. In that case your initial 500 split adjusted Disney shares would have increased to a total of about 700 shares as of today. The stock is currently trading at around the $95 mark, giving your investment a current value of $67,000. That’s equivalent to an average annual total return of 10% per year. Assuming the 2016 dividend grows in-line with expectations you would be looking at income of over $1,000 for the year. Now in more recent years the earnings value multiple has come down. In the market chaos of 2009 for example Disney stock spent the year at an average annual P/E ratio of just 12.5x earnings; a once in a generation entry point which would have given a prospective investor capital gains of 27.5% a year in the seven years since. The decline in subscribers to flagship sports network ESPN, which is responsible for just under half of Disney’s profits, has caused the shares to retreat by about 20% from their all time 2015 highs. It currently trades around 16x expected annual earnings. For a company with such an enduring legacy of wealth creation it would take a brave individual to bet that in the decades to come those shares won’t continue to spin-off cash and be worth significantly more than they are today.